Wine is omnipresent in bouchons. Red, rosé or white, all quality vintages. In the words of Léon Daudet, “Lyon is watered by three major rivers: the Rhône, the Saône and the Beaujolais, which is never loamy or dry“. The pot lyonnais (wine carafe) is a centuries-old tradition. In the Middle Ages, it was known as the Asnee and could hold… 93 litres! Over the centuries, its capacity decreased to arrive at the one we are now familiar with. Served at the table during the meal, the genuine wine carafe must hold 46 cl and not a drop more! Of course, wine is also served as an aperitif. 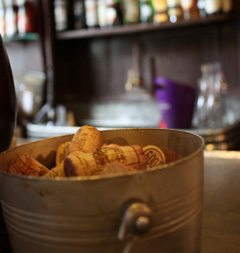 Wine also features in certain typical Lyon dishes such as andouillette (offal sausage), œufs meurette (poached eggs in a red wine sauce) or sabodet, a cured sausage made of pig’s head and pork rind, cooked in red wine. Due to its geographical location, Lyon is a major hub for wine production and trade. In ancient times, the city had a monopoly on wine! In the Middle Ages, the hills of Fourvière, Sainte-Foy-lès-Lyon and the slopes of the Croix-Rousse district were covered with vines. Nowadays, a few vineyards remain on the hills but only a select few are invited to the harvest! Have you ever heard of the communard? This delicious drink is based on Beaujolais and crème de cassis. Its origin remains unclear. The recipe comes from Burgundy and is a derivative of kir.